Anyone else out there feeling the new year vibe yet? Or is it just me? Please tell me I’m not alone…although perhaps I am! Whereas a month or so ago January seemed out of sight, now it is coming into vision. Much of what has been happening here at A Life Of One’s Own lately focuses around the end of this year and the early months of 2015. I’ve begun planning a new year workshop and am also in discussions about running a short course on journaling in January and February. As well as these two events, my mind has started to scheme and hatch up other dreams and goals for 2015, both in my personal and professional life. Maybe it’s because I’ve made more progress than I ever could imagined at the beginning of 2014 and now I’m keen to push further, to develop fresh ambitions. Maybe it’s because the long dark nights are a bit depressing and looking ahead to the new year and the promise of spring is a means of escapism. Either way, I have that clean slate, fresh start 1st January feeling in my bones. There is, of course, one problem with that: namely, that there are still forty-two days to go until we get to 2015. I don’t want to miss out on being present in the here and now, in my actual life, by dreaming and scheming for the future. In particular, I don’t want to miss out on all the joy and excitement of Christmas. I want to show up for every single day and drink in the glitter and the sparkle and the warm fuzzy glow of it all. I want to be able to do this even though I have some major work deadlines before then. Even though I haven’t thought about my Christmas shopping yet. Even though this Christmas Day will be totally different from every other one I’ve ever had. Even though I haven’t a clue when the final posting date for New Zealand is and that information would be really useful right now*. How am I going to do this? 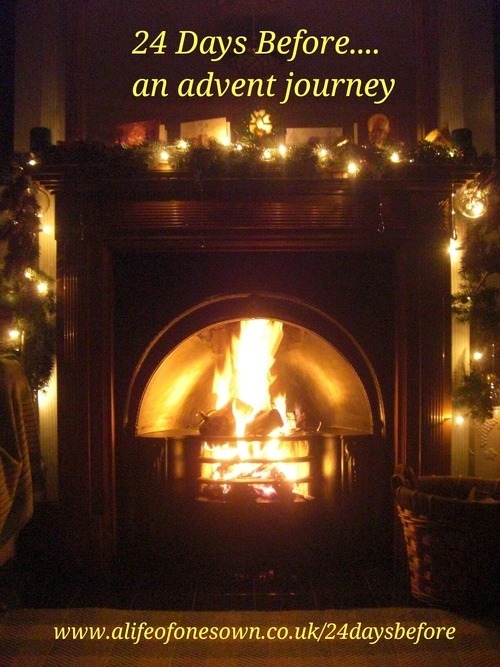 By opening up to the suggestions I put forward in 24 Days Before , the advent journey that I’ve created. I designed 24 Days Before to support participants in reaching in and reaching out at what is generally the craziest time of the year, and I’ve realized that I need that support as much as anyone – so I’ll be joining in opening the daily email along with those women from around the world who have already signed up for it. If you want to join us on this journey and explore ways to deepen a sense of meaning and connection during December, all the details are over on the 24 Days Before page. 42 days until the end of the year…why not share a journey for 24 of them? * The answer is 3rd December. I just looked it up. All the final posting dates from the UK are detailed here. Remember the excitement and anticipation generated from having an advent calendar when you were a child? What if you could recreate similar feelings about Christmas now you’re an adult? How amazing would it feel if you could capture some of the fun and delight – maybe even [gasp!] pleasure ­– of the festive season again, rather than treating December like a time that you just need to get through? Imagine waking up on Christmas Day feeling nurtured rather than frazzled, loving rather than harangued, childlike rather than Scrooge-like. Like that idea (and who wouldn’t?!)? Then how about receiving an advent calendar equivalent of your own?